The Mister and the Missus stand on top of my refrigerator, and they have been a part of my kitchen for many years. 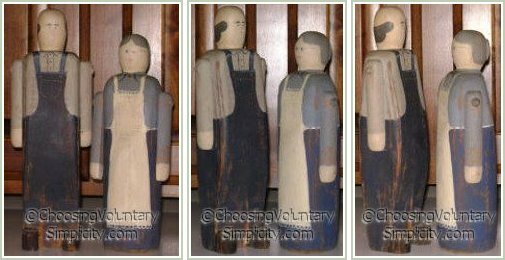 I think having a few non-functional treasures like these around adds warmth and character to any room, and I especially like these figures because to me they look like a cruder version of the people in the Grant Wood painting “American Gothic” (minus the pitchfork, of course!). They always make me want to smile. I love to walk into a room and see a piece of whimsy. It tells me a lot about the person I am visiting. These figures make me smile, too. Thanks! I love your Mister and Missus. I have three tribal figurines – two of which used to belong to my grandfather. The reason I love them is that they are so completely different than anything else he ever had – he was Italian and everything he had other than these figurines was more gilted and heavy. 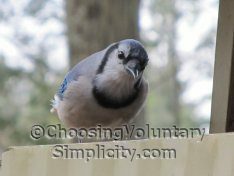 Sometimes simple is most beautiful. I love those! I used to have a set of stuffed little rabbits, very similar to your people, only cloth. They had very simple handstitched faces. I adored those, had them for many years.